Utility-scale renewable electricity generation surpassed nuclear for the first time since Reagan was president. Solar farms planted on an abandoned nuclear plant site or powering a coal museum or atop a strip mine offer stark images of the ascendance of renewables. Recent months have seen record generation from wind and solar, as well as increases in hydroelectric power because of 2017's wet winter (note that these numbers, from the Energy Information Administration, do not include distributed solar). Most of the time, conventional hydroelectric generation is still the primary source of renewable electricity. 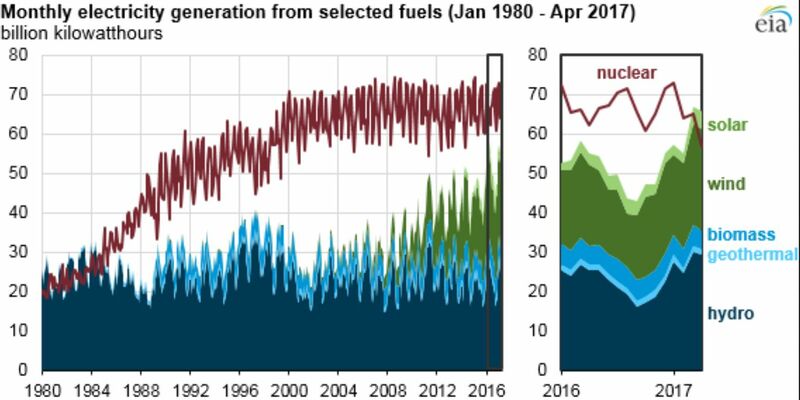 But one of the takeaways from this data set is the emergence of wind in the last decade as a material slice of the energy mix. The U.S. wind industry installed more than 8 gigawatts in 2015 and did it again in 2016. The country now has over 84 gigawatts of installed wind capacity. Another takeaway is the relatively diminutive contribution from solar, which falls between geothermal and biomass in its annual contribution. The U.S. installed 14.5 gigawatts of solar last year, up 95 percent over 2015. And still, more than 60 percent of all utility-scale electricity generating capacity that came on-line in 2016 was from wind and solar technologies, according to EIA. Admittedly, the renewables total just barely touched the nuclear generation total, and EIA expects monthly nuclear output to overtake renewables again this summer and to generate more electricity than renewables for all of 2017. But nuclear power has been essentially flat for decades at about 19 percent of the U.S. total. Variances in nuclear output stem from scheduled plant shutdowns and the slow but steady beat of nuclear plant closures. 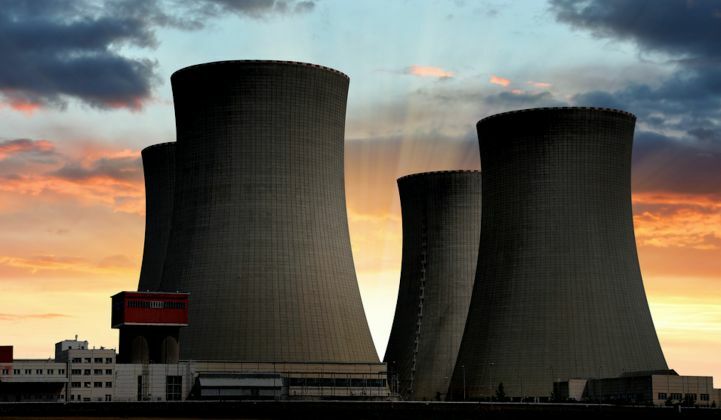 The nation's first new nuclear plant in 20 years, the Tennessee Valley Authority's Watts Bar 2, went offline in March after five months of commercial operation. The TVA is examining a failure in the condenser mechanism before the plant can come back on-line. While we're on the subject of nuclear power, The New York Times just reported that Russian hackers have recently penetrated the computer networks of energy generators including the Wolf Creek Nuclear Operating Corporation, the operator of a nuclear power plant in Kansas. "There was absolutely no operational impact to Wolf Creek," a spokesperson told Bloomberg News. And while renewables and nuclear might be running neck and neck, keep in mind that coal and natural gas combined accounted for approximately 65 percent of U.S. power generation in 2016.